The truth is, though, that Latin Christians were desperate. And people can do strange things when they are desperate. With the only commands and forbiddings coming from the Vatican, the crusading armies were not forced to submit to anyone. The crusading armies were susceptible to the influence of other leaders and governments they might encounter along the way. The latter result reared its head soon after the crusaders departed France in 1202. The initial strategy was to enter Jerusalem after conquering Egypt. In a move that would soon backfire, the crusaders sought transport to Africa from the Venetians. Since they were unable to pay the full balance for the voyage up front, they swore a temporary allegiance to Venice. Under the heavy-handed influence of the doge of Venice, Henry Dandolo (died AD 1205), the crusaders made their first offensive move. The siege would not come against a city held by Muslims, however. Instead, the Latin Christians joined the Venetians in an attack on the nearby Eastern Christian city of Zara (modern-day Croatia). 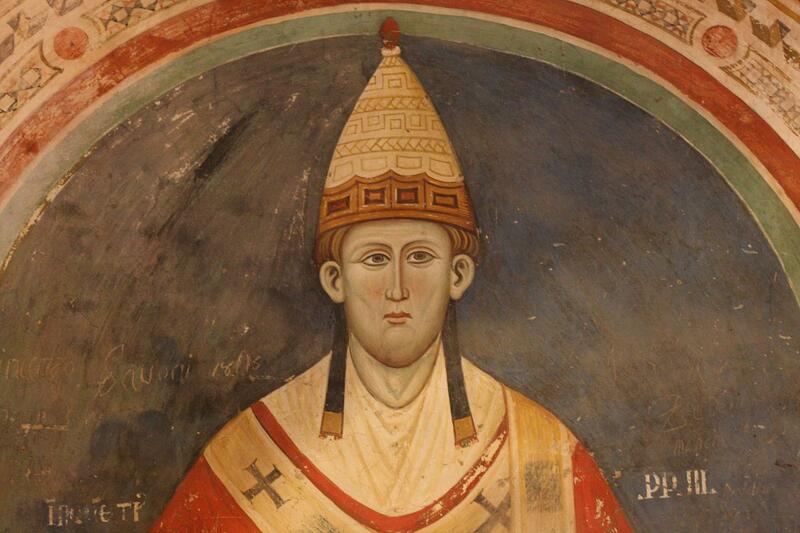 When Innocent III heard rumors of the planned attack, he sent orders strictly forbidding such actions and even threatened excommunication. His command was not heeded, however, and on November 24, 1202, the Latin crusaders laid siege to, plundered, and utterly destroyed the city of Zara. For the next several months, Zara would become the staging area for planning a second offensive that would eventually do more damage to the Christian faith than could have possibly been imagined. The Venetians had their sights set on Constantinople. Because of internal conflict between Alexius III and Alexius the son of Isaac over the Eastern throne, the capital of the Eastern Empire was at a vulnerable point. The Latin Christians, who had been in schism with the Eastern Christians since AD 1054, were once again persuaded to join the Venetians in conquest. In 1203 and 1204, the crusaders again attacked their Christian brothers and sisters and captured Constantinople. More than one ancient source records the “wanderlust” of this particular crusade, as Constantinople was plundered of its relics and treasures. Several accounts also describe rampant sexual immorality and orgies that took place at the initiative of the crusaders. 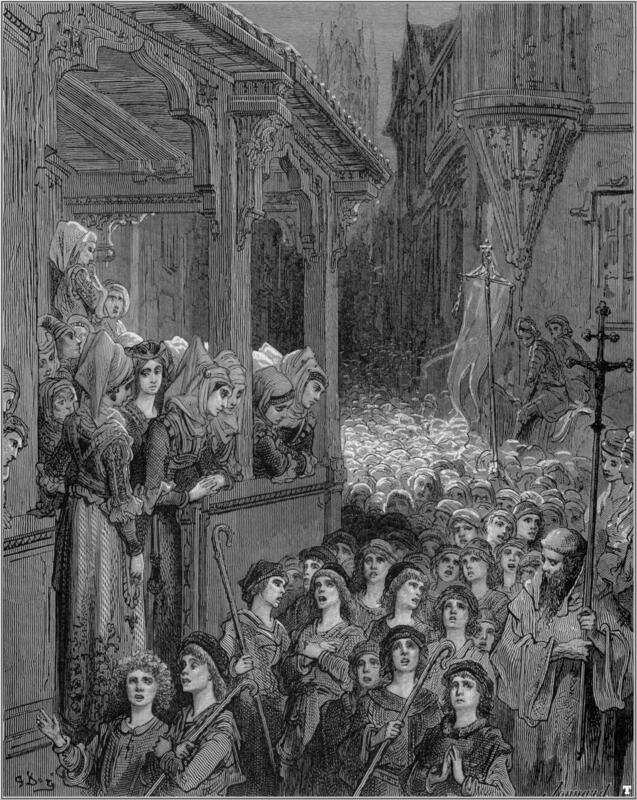 The final result of the Fourth Crusade was the establishment of another Christian “kingdom” of the likes of Jerusalem during the First Crusade. Thus began the Latin Kingdom of Constantinople — established in 1204 — with its capital at Constantinople. Baldwin of Flanders was chosen as the new Emperor of the “united” Constantinople, and he immediately began distributing Eastern lands among Western knights. The Latin Kingdom of Constantinople (1204-1261) even had its own minted coins like the one shown here, with Christ on one side and an Emperor (such as Baldwin) on the reverse. The Latin Kingdom of Constantinople would last until 1261, until it was recaptured by the Byzantines. The damage done between Eastern and Western Christians, however, would take centuries to repair. For those of Eastern Orthodox faith traditions, these events will certainly never be forgotten. There is much confusion and silence in the historical tradition regarding from whence the call for the Children’s Crusades came. In all likelihood, there was no call from the papacy or clergy for a youth-targeted crusader movement. On the contrary, the crusading spirit had such a strong thrust that most people were still caught up in it. It would appear these young people truly felt some responsibility to play a role in the missions for the Cross. In AD 1212, groups of young adults and children in both France and Germany–even some under the age of 10–began to organize into bands of crusaders. Two boys in particular, a 12-year old shepherd boy named Stephen of Cloyes, and a 10-year old boy called Nicholas of Cologne, preached the crusading spirit to their peers, promising that God would surely grant victory to children who were innocent of mortal sins. They argued God had a special allegiance to children, and thus it was their responsibility to fulfill God’s mission that had been abandoned by adults — defeating the Muslims and recapturing Jerusalem. Some estimates have the French children’s army as having reached 30,000 young adults and children — both boys and girls. Unfortunate events began to unfold even before the young crusaders left the country, however, when they encountered two dangerous charlatans. It was in Marseille that the groups were taken in by Hugo Ferreus and William Porcus — two Mediterranean slave traders with an eye to take advantage. 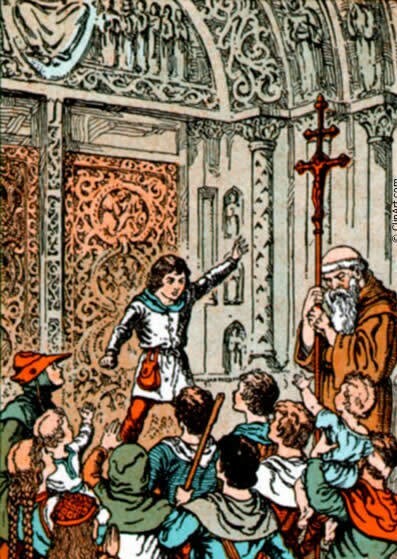 The dealers swore allegiance to God and promised Stephen and his young crusaders a free ride to the Holy Land. They convinced the crusaders to board their seven ships and then set sail toward their destination. But Ferreus and Porcus had no plans to sail to the Israeli shores. Instead, they intended to carry the boys and girls and all of their valuables to Africa – never to be returned. Two of the vessels were shipwrecked in Sardinia and never even reached Africa. The remaining ships indeed carried the children to Africa where most of them became slaves in Egypt. In Germany, Nicholas and another young man rallied more than 20,000 troops of their own. From Cologne these groups of adults, boys, and girls left for the Holy Land. Some attempted to cross the Swiss Alps and were never heard from again. Others either died or were redirected at different points in the journey, leaving Nicholas’ army at only 7,000 by the time they reached Italy. They too never reached Jerusalem and found tragic ends to their young crusading spirit.